1. I first came across your work on Black Girls Talking and was definitely intrigued and wanted to know more about you. 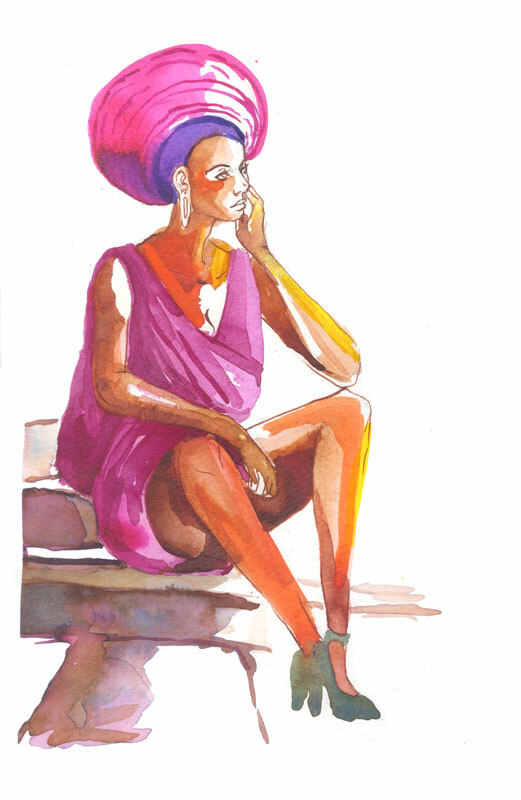 Tell us a bit about yourself and how you became a fashion illustrator? As many artists can tell you, I grew up doing a lot of drawing and was surrounded by a lot of great illustrative work. I loved (and still love!) collecting beautiful illustrated books. Drawing for a living always was a fantasy when I was younger and I didn’t seriously put thought into pursuing it until high school, when I decided to apply to MICA in Baltimore. I got good grades while in college but struggled with where I fit or what I wanted to do with my art. I was very lucky and was hired at Seventeen Magazine during my junior year and that set me on the path to fashion illustration. I was always drawn to it. 2. What inspires you and your work? And how do your pieces come together? I’m inspired by a wide range of things; my style is largely impressionistic so I am drawn to ‘sensual’ themes–love, loss, memory, interpersonal relationships, etc. A lot of things inspire me even if they don’t directly inform my work, as well — non-Western belief systems, rituals, the grotesque. When I work on personal work, I like drawing simple shapes, lines and fields of color and see what evolves from there. My process is very organic and reliant on feelings. I have to get the right amount of push and pull, detail and simplicity. 3. Which designers are your favourites to illustrate? I like drawing the clothes I would like to wear! Some of my favorite brands are Helmut Lang, Proenza Schoeler, Vena Cava, Kate Spade, etc. 4. With the growth of new media and platforms such as Pinterest, Instagram, Twitter there seems to be quite a number of fashion illustrators showcasing their work and this has moved on to fashion magazines and websites showcasing sketchbooks and commissioning illustrators – why do you think illustration excites people? I think it’s exciting because it’s so accessible. Obviously, there are a range of styles in all artistic mediums but I think illustration can be very democratic. Not everyone has access to expensive art materials or visiting museums. It’s much easier to pick up a set of watercolors and inks and be able to show your art to a wider audience. I think the Internet is a great tool to be exposed to different ideas and people that you never would have experienced otherwise. 5. 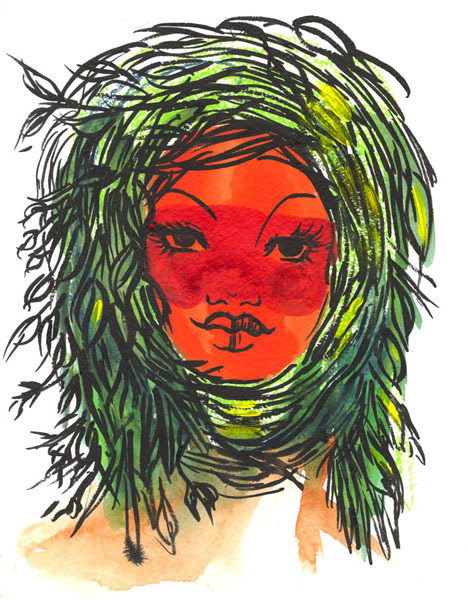 What advice would you give to anyone wanting to pursue fashion illustration as a career? Take in everything, not just fashion. Your personal vocabulary informs your work so be receptive. Take interest in other artists and their processes. It helps to save images you’re drawn to, either on your hard drive or keep a scrapbook to consolidate your inspiration. Find pieces you’re drawn to and ask yourself WHY you’re drawn to it. Also, experiment with mediums a lot. I only figured out that traditional mediums work best with my ‘hand’, so to speak. That was after 3 years of art school! 6. Tell us any 3 fun facts about yourself. I love Beyonce Gisele Knowles-Carter more than most things. I watch Judge Judy every night. Pam Grier is one of my heroes. 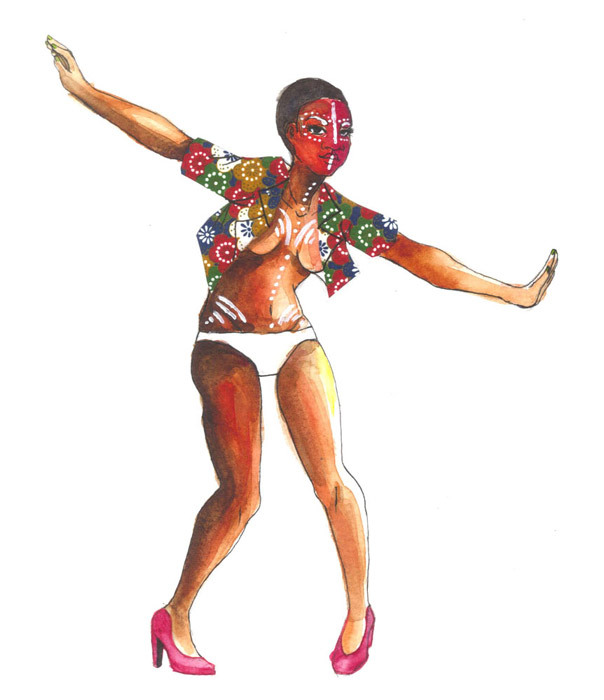 The illustrations used in this article are from Brittnay’s Uzuri series. Uzuri means ‘beauty’ in Swahili. I am very interested in racial identity and femininity. I wanted to create a series of fashion illustrations with women you don’t normally see in the fashion world. This series is about the combination of non-Western ideals of beauty with Western costuming and shown in a fashion editorial light.